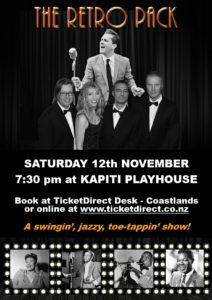 Celebrating the era of Jazz singers with The Retro Pack - Kapiti Playhouse Inc.
A group of Wellington’s busiest jazz musicians have collaborated to present a celebration of the great era of jazz singers at The Kapiti Playhouse on 12th November. 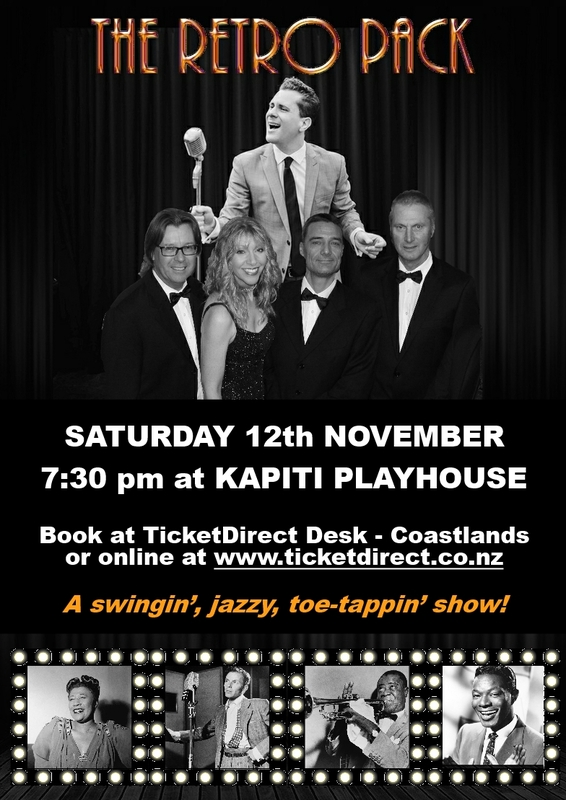 The ‘Retro Pack’ have presented award-winning shows in the past including ‘Blue Eyes’; a tribute to Frank Sinatra, ‘Unforgettable – the Story of Nat King Cole’ and ‘The Glory of Gershwin’ which featured in the Wellington Jazz Festival in 2016. The Retro Pack have cherry-picked a repertoire of standards popularised by the greatest jazz singers of the 20th Century – Frank Sinatra, Ella Fitzgerald, Bobby Darin, Dean Martin and Nat King Cole among others, and assembled a band of experienced jazz musicians to evoke the ‘Rat Pack’ era with unforgettable tunes such as ‘I Get a Kick Out of You’, ‘Something Stupid’, ‘Mack The Knife’ and many more. The cast features celebrated singer, actress, playwright and movie-maker April Phillips who created and scripted ‘Blue Eyes’, ‘Unforgettable’ and ‘The Glory of Gershwin’, ex-Hot Club Sandwich singer/guitarist Andrew London, bass player and vocalist for the Velox Brothers and Cattlestops James Cameron, vocalist and saxophonist James Tait-Jamieson, pianist Anita Schwabe and drummer Greg Crayford. The “Pack” are delighted to be performing at the Kapiti Playhouse. Andrew and James are locals, April’s family live on the coast, and April’s latest play “Motel” was produced at the Playhouse in 2015. It’s good to be home and they promise a fun night of swinging, jazzy, toe-tapping nostalgia. Ticket information can be found on our The Retro Pack event page. For further information about The Retro Pack see Andrew London’s website or contact him at london [at] paradise [dot] net [dot] nz.